The Breitenbush Mushroom Gathering was the best sleep-away camp ever. My goal was to learn how to identify different Agaricus mushrooms, since I can’t seem to figure it out by myself and a few guide books. There weren’t many Agaricus out in Willamette National Forest, so what I got instead was more chanterelles than I can hope to eat and newfound respect and terror of taxonomy. For those of you who have not had the pleasure, Breitenbush is sort of a hippie commune hot springs resort in the Cascades. The tubs are clothing optional and one of them is silent. The gift shop sells woo woo books on sexuality. Meals are hearty and vegetarian, and they don’t provide coffee or caffeinated tea. The campus feels isolated and very natural. When I arrived on Thursday I was giddy to see all the mushrooms growing just on Breitenbush grounds. So many Russulas, Lactarius, and Amanitas sprouting up between the pathways. In the mornings on Friday and Saturday, we rose in time for breakfast by the Breitenbush staff and went mushroom hunting until one in the afternoon. The first day brought in a glorious load. My team found more matsutakes than we wanted. In one area no more than 10 feet in diameter, I found a matsutake, a hefty chanterelle, and a sizable clump of Sparassis (cauliflower fungus). The same day, another team carried back enough white, yellow, and winter chanterelles to please a professional picker. Back at the Breitenbush, we dumped our edibles on one table and our mystery mushrooms on another for identification by expert mycologists. After lunch came workshops, then dinner, and nighttime talks, then nerdy mushroom partying (we ate cheese, drank wine, and talked more mushrooms). Then got up and do it again. Despite staying at a place meant for soaking in restoring mineral water, I only went in the tubs once or twice a day. It was all mushrooms, all the time. I’m really tired. I might be sick of mushrooms. Just kidding. That will never happen. I am getting a little moody and ambivalent about them, though. A nighttime talk by Noah Siegel on the taxonomy of boletes made me want to curl up in a ball in my sleeping bag and cry. Just when I’m beginning to feel like I’m getting a handle on the different types of mushrooms, he tells me that they’re all going to change their scientific names. Mycology isn’t as advanced as zoology or botany. They’re finding new species of mushrooms constantly. Noah expected to find new species just from this Mushroom Gathering. He himself had identified a number of new boletes in the past few years and asserts that many of the known ones are misclassified. The king bolete, or Boletus edulis isn’t one mushroom; it’s many individual species of mushrooms. Not only is the European Boletus edulis different from the North American one, but each geographical region of the United States probably has its own species of king bolete. 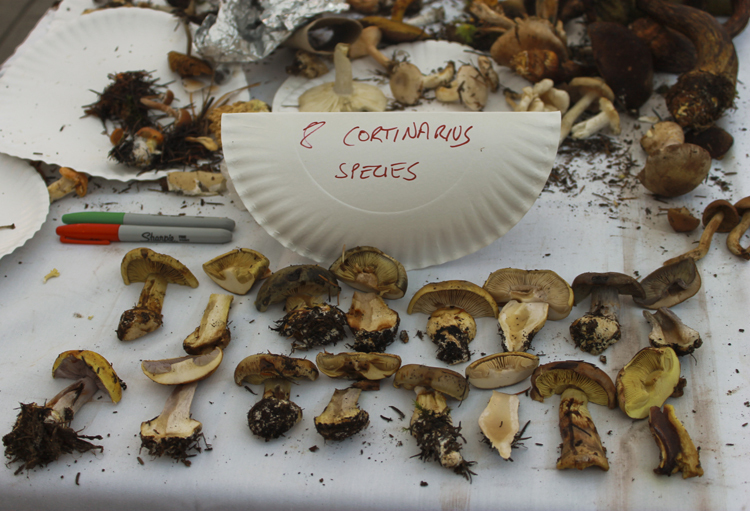 While most of the new species of mushrooms he finds are typically ignored by mushroom foragers (mostly LBMs-Little Brown Mushrooms), it’s difficult to get enough samples of the king bolete to conduct a scientific study. Instead of offering specimens to scientists like him, people are just going out and eating them all. I knew you had to be careful when gathering mushrooms, but I did not realize how much there was to know about the subject. I love this place and try to go as much as I can afford it. i had no idea they had a mushroom gathering! so jealous! 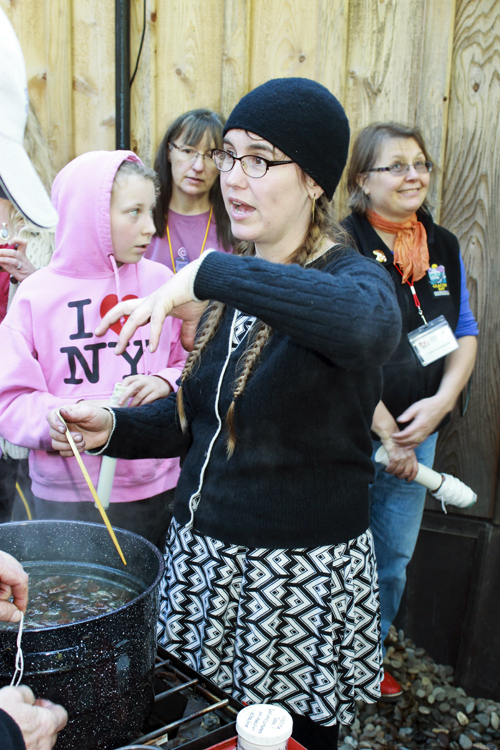 The Mushroom Gathering is a separate entity from Breitenbush using Breitenbush as the venue. It’s a pretty expensive conference due to lodging costs, but since it was related to my thesis, I felt I could justify it.